Cherry Mobile Flare Maxx With 6.44 Inch FHD Screen And 6010 mAh Battery Is Priced At PHP 9999! Home / cherry mobile / mobile / news / Cherry Mobile Flare Maxx With 6.44 Inch FHD Screen And 6010 mAh Battery Is Priced At PHP 9999! One of the most exciting phones that Cherry will offer this Christmas season is the Flare Maxx! It's a gigantic phone with incredible amount of battery capacity and decent specs in the sub PHP 10K range. The highlights that we are talking about are its 6.44 inch FHD screen designed for those who have big hands and 6,010 mAh battery capacity that can surely last for a day or two on a single charge. On top of that, the phone also loads with 1.3 GHz 64 Bit MT6753 octa core processor, 3 GB RAM, 32 GB storage, 13 MP main camera, 8 MP selfie camera, and Android 6.0 Marshmallow operating system out of the box. 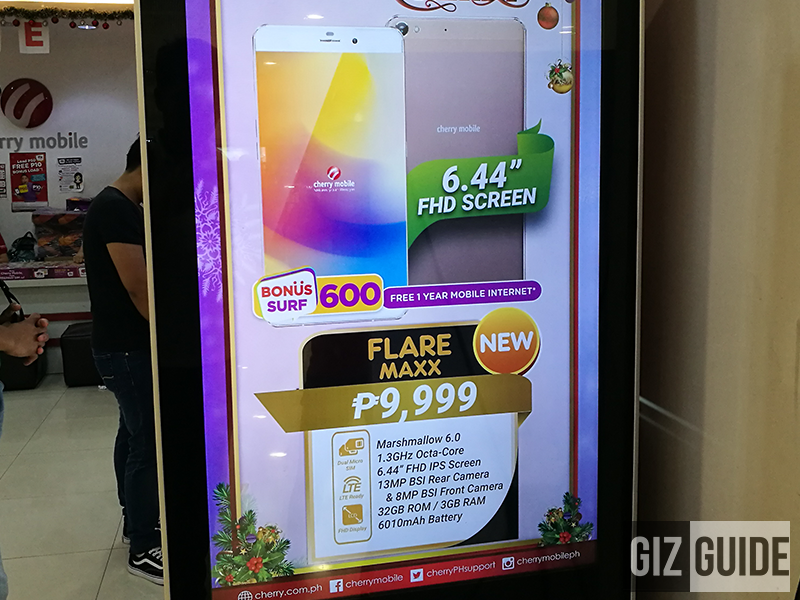 Priced at just PHP 9,999, the Cherry Mobile Flare Maxx seems to be a great deal for people who cares about big screens and long battery life.